With its heavy-duty cast-iron body that incorporates stainless steel components, the model is as sturdy and durable as they come. 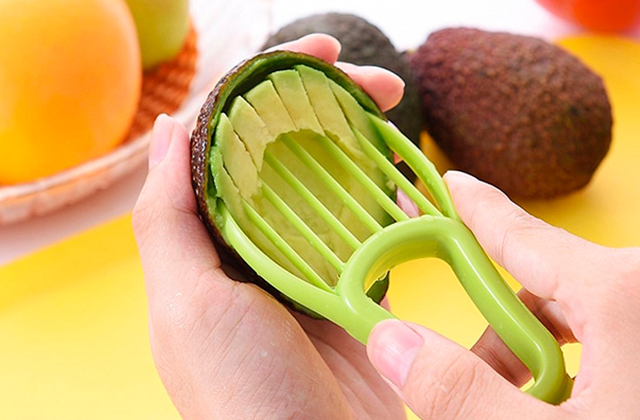 It is fitted with 4 strong suction cups, so you'll be able to fix/fasten the cutter to the smoothest surface. You can even mount it onto a wall. You can't make different stick sizes because the cutter comes with just 1 blade. New Star Foodservice 42313 is suitable for commercial and residential use. 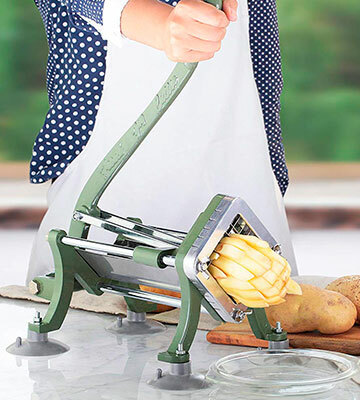 With it, you'll be able to restaurant-quality french fries and cut other tubers and vegetables. Most importantly, the model is particularly versatile and will allow you to work with the largest potatoes. Up to 6" x 3.25" x 3.25"
Since the blades are really sharp, you'll never have to deal with bent or blunt french fries. 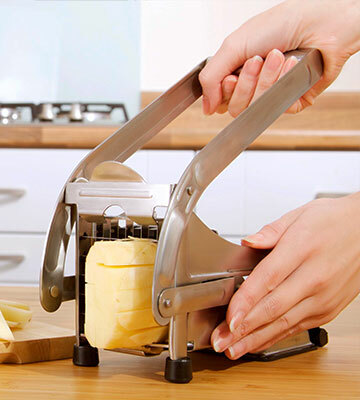 The extended handle makes it a lot easier to push potatoes and other vegetables through the blades. The suction cup is not very strong. 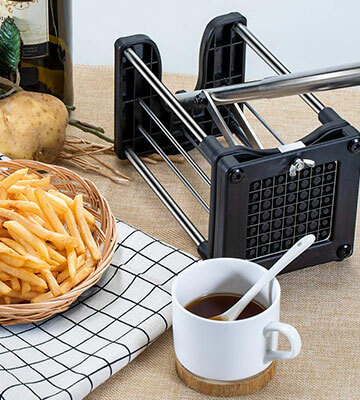 Reliatronic Heavy Duty French Fry Cutter will allow you to enjoy your favorite potato-based snack with very little effort and involvement on your part. The cutter is easy to maintain. The stainless steel components, as well as the plastic body, aren't susceptible to rust and corrosion. Up to 5" x 2.9" x 2.9"
Sticks size: 1/2" or 3/8"
The model's curved bottom design makes it really easy and convenient to load the vegetables. You barely have to apply any force to the handle. The stainless steel blades are easily detachable. You can change them with but a simple yet secure click. Doesn't work with larger tubers and vegetables. Culina CUL-20142 is a very well-thought-out cutter. It has a sleek, almost sophisticated design. The stainless steel components are dishwasher safe. 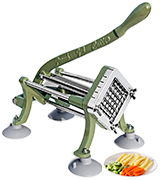 Though dubbed a french fry cutter, it is just as suitable for cutting cucumbers, zucchinis, and so many different vegetables. Up to 4.5" x 2.3" x 2.3"
The tool will, more often than not, double as a veggie slicer. With it, you'll be able to make snacks portions of cucumbers, celery, carrots, apples, peppers, the list goes on. Its plastic handle comes equipped with rubberized coating, giving you a soft but firm grip. 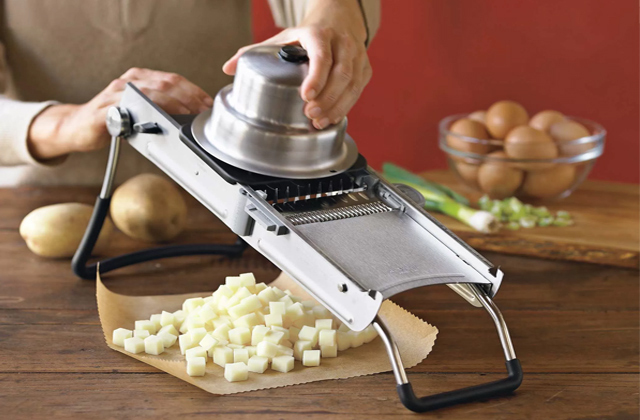 Prepworks by Progressive Deluxe Jumbo GPC-3665 will prove a good choice for people who are looking not just for a french fry cutter but a versatile, multipurpose kitchen tool that can be applied in more ways than one. Up to 5" x 3" x 3"
Provided you slightly soften them beforehand, the model will allow you to cut sweet potatoes, beets, and yams. 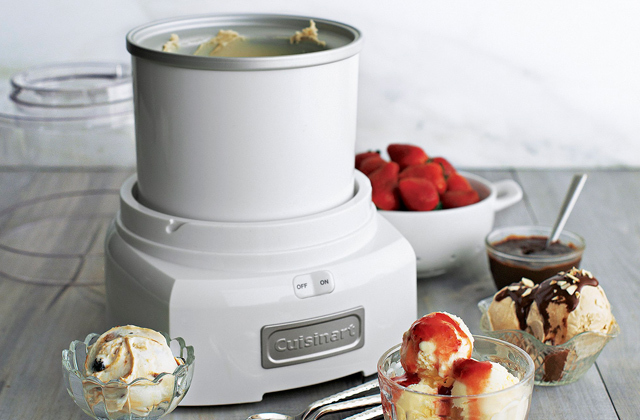 The food-grade plastic pusher doesn't take on residual tastes or odours, so it will not affect your meals' flavor. The horizontal handle isn't necessarily ergonomic or all that practical. Impeccable Culinary Objects ICO018 is a good cutter. It isn't necessarily the most versatile tool, sure. 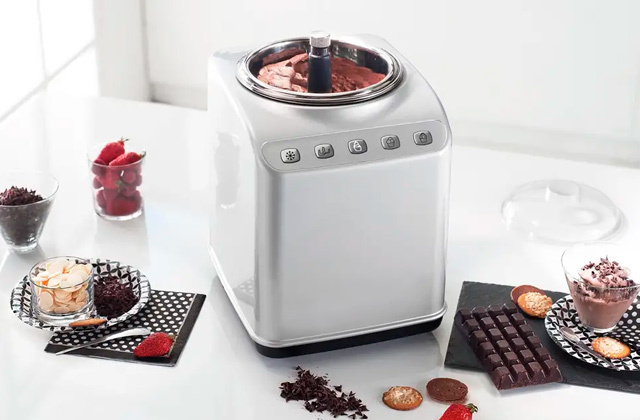 But the price is nice and the model's suction cups are really strong, so it will not be sliding around the countertop. Up to 4" x 2.5" x 2.5"
New Star Foodservice 42313 looks like a robust and convoluted machine but it is only the first part that's accurate. With its heavy-duty cast-iron body that incorporates stainless steel components, the model is as sturdy and durable as they come. You could easily maim and kill a man with this thing (note that we do not condone violence nor do we recommend application like that). 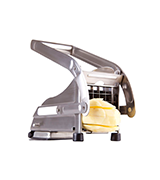 It comes equipped with 4 strong suction cups, so you'll be able to fix/fasten the cutter to the smoothest surface. 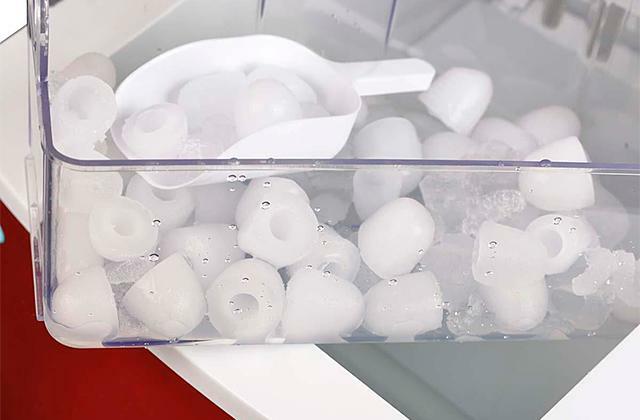 Furthermore, the cups are so strong that it is entirely possible to mount the model onto a wall, meaning you can save a lot of countertop space if necessary. Considering the model's size, you'll be able to easily cut potatoes up to 6" long into 1/2" french fries. 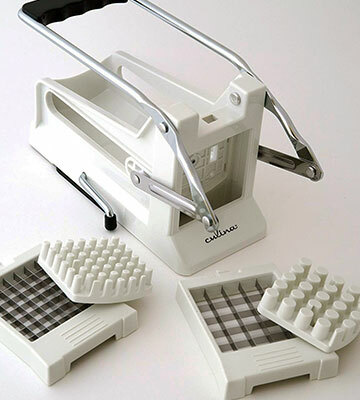 Similar to any other french fry cutter, this tool will allow you to make sweet potato fries, zucchini sticks, and other dishes/ingredients. About the only issue we have with this particular model compared to every other cutter on this list is that you can't make different stick sizes because the cutter comes with just 1 blade. 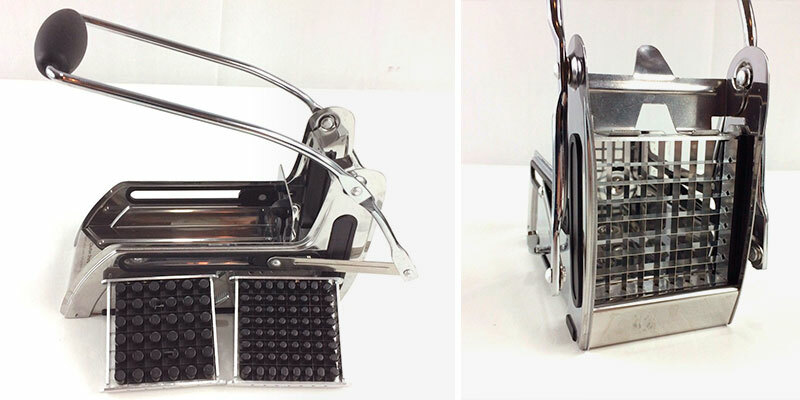 Apart from that, New Star Foodservice 42313 is probably the best french fry cutter here, perfectly suitable for commercial and residential use. 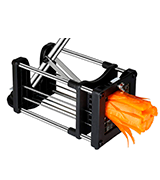 With it, you'll be able to restaurant-quality french fries and cut other tubers and vegetables. Most importantly, the model is particularly versatile and will allow you to work with the largest potatoes. This product did NOT meet my expectations. It far EXCEEDED them. It's a little tricky to clean, but well worth it. I ended up buying a couple different die sizes, so I can please everyone with the size fries they like. It is heavy built and stands up fine to the pressure of shoving through regular potatoes. I don't know that it would work as well for sweet potatoes but I have not tried to say personally. 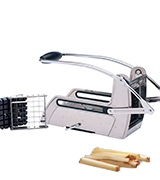 Reliatronic Heavy Duty French Fry Cutter is mostly about its blades but a little bit about the handle too. First, the blades will allow you to make 1/2" or 3/8 sticks, nothing unusual but it is nice to have the option nonetheless. More importantly, the stainless steel blades are really sharp and particularly durable. They are practically immune to rust and corrosion. Using these blades, you'll never have to deal with bent or blunt french fries. Now, let's pivot towards the handle. 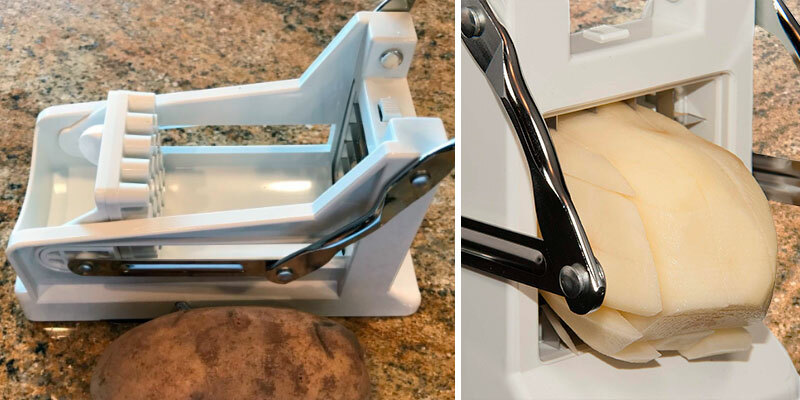 It doesn't seem or sound that different on paper but, extended a little, the handle makes it a lot easier to push potatoes and other vegetables through the blades. 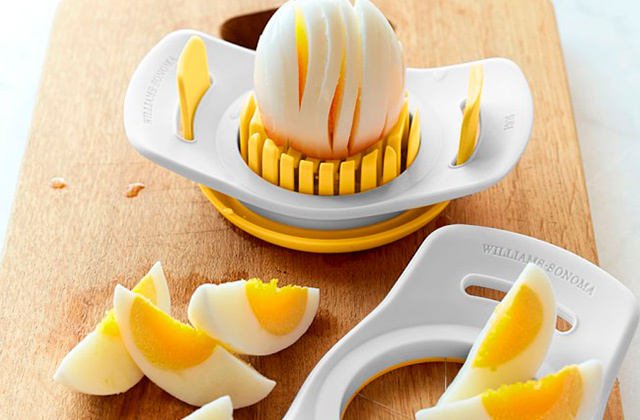 It requires less effort on your part and that is never a bad thing, at least as far as kitchen tools are concerned. Other than that, there isn't much to add here. The model comes equipped with suction cups but, unfortunately, these cups aren't very strong, so we can't say that they're particularly useful. On the bright side, the cutter is easy to maintain. The stainless steel components, as well as the plastic body, aren't susceptible to rust, so you can just rinse the tool under tap water and give it a nice wipe or a brush. 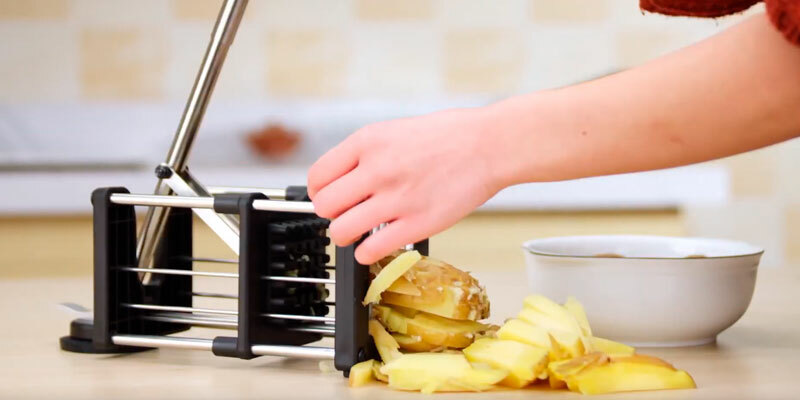 To put it differently, Reliatronic Heavy Duty French Fry Cutter will allow you to enjoy your favorite potato-based snack with very little effort and involvement on your part. Plus, considering how sturdy and robust it is, you should be able to enjoy these snacks for years to come. Culina CUL-20142 is one of the most well-thought-out potato choppers on the market today. The only thing we have against it is the relatively limited vegetable size that it can work with. You'll be fine with tubers and vegetables that measure up to 4.5" x 2.3" x 2.3" in overall dimensions but you won't be able to cut anything larger than that, which is a shame. Apart from that, however, there's very little to complain about here. 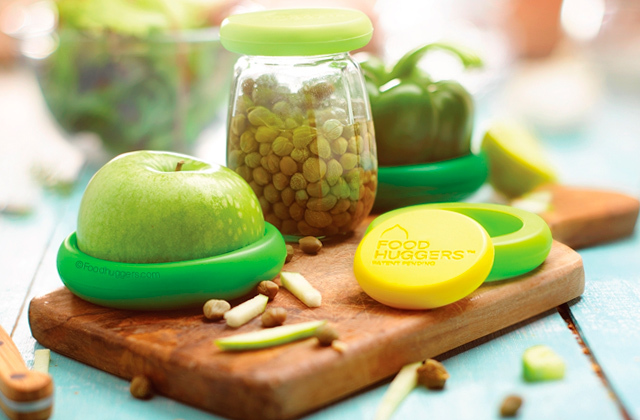 The model's curved bottom design makes it really easy and convenient to load the vegetables. You barely have to apply any force to the handle. On top of that, the handle comes equipped with a soft and comfortable grip, a real pleasure to deal with. The stainless steel blades are easily detachable. You can change them with but a simple yet secure click. As far as the stick sizes are concerned, the blades here don't differ that much from what we usually see in these fry makers. One will let you cut vegetables into 1/2" sticks, while the other will allow you to make slightly smaller 3/8" ones. The practically obligatory suction cups on the base are a little stronger than your usual deal. You can fasten them to any surface and go to town on the cutter. Once more, Culina CUL-20142 is a very well-thought-out cutter. It has a sleek, almost sophisticated design. 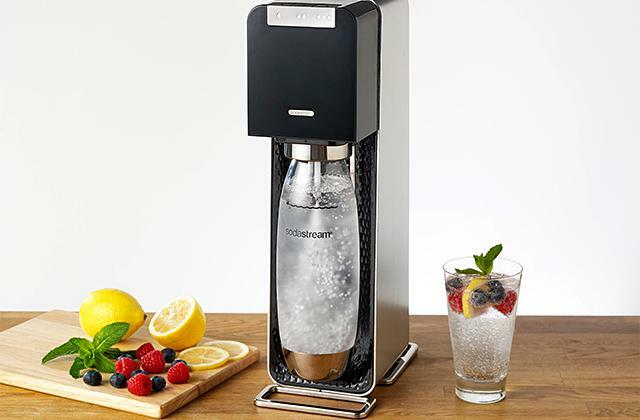 The stainless steel components are dishwasher safe. 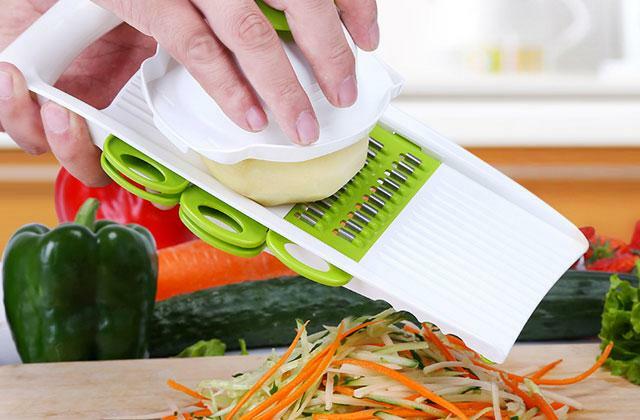 Though dubbed a french fry cutter, it is just as suitable for cutting cucumbers, zucchinis, and so many different vegetables. We wouldn't say that Prepworks by Progressive Deluxe Jumbo GPC-3665 is such a deluxe jumbo. 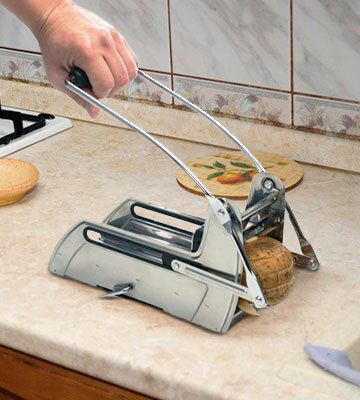 It isn't a bad cutter but it is not without its flaws either. For starters, its versatility isn't necessarily off but it isn't great too. 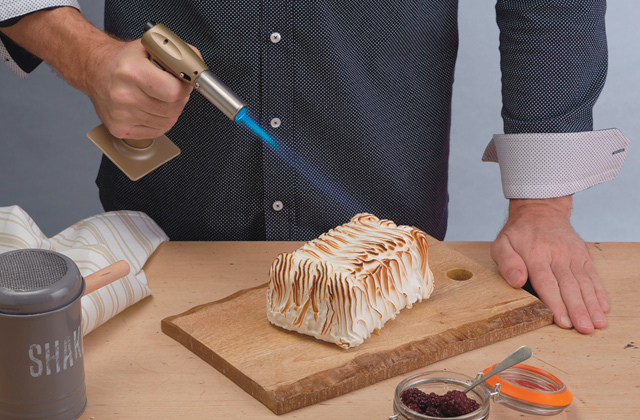 Naturally, you can use the model to cut potatoes but also carrots and zucchinis. You can try your luck with yams but the result won't always be perfect. The manufacturers do not recommend using the model with sweet potatoes either. On the other hand, the tool will, more often than not, double as a veggie slicer. With it, you'll be able to make snacks portions of cucumbers, celery, carrots, apples, peppers, the list goes on. It works perfectly fine with vegetables that measure 5" x 3" x 3" in overall dimensions, so your option list won't be all that limited. When it comes to design and construction, the model mostly delivers. Its plastic handle comes equipped with rubberized coating, giving you a soft but firm grip, practically excluding any slipping chances. The blades are detachable and will allow you to make 1/2" or 3/8" sticks. But they aren't corrosion-resistant, so you can't really put them in a dishwasher. 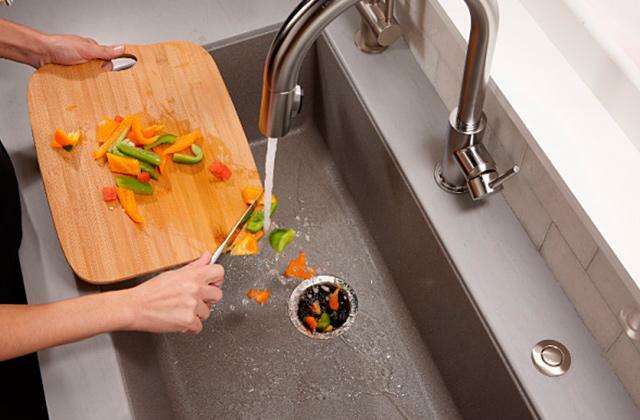 All in all, Prepworks by Progressive Deluxe Jumbo GPC-3665 will prove a good choice for people who are looking not just for a french fry cutter but a versatile, multipurpose kitchen tool that can be applied in more ways than one. Impeccable Culinary Objects is a terrible name, we have to be blunt here. Now, their products aren't bad and we have very little issues with the model in question but the name needs some improvement. But we digress. What we're dealing with here and what we should be talking about is a pretty good cutter, perfectly suitable for home use. It comes with 2 different blades that will let you make shoestring (3/8 inches) sticks as well as larger, 1/2-inch sticks. 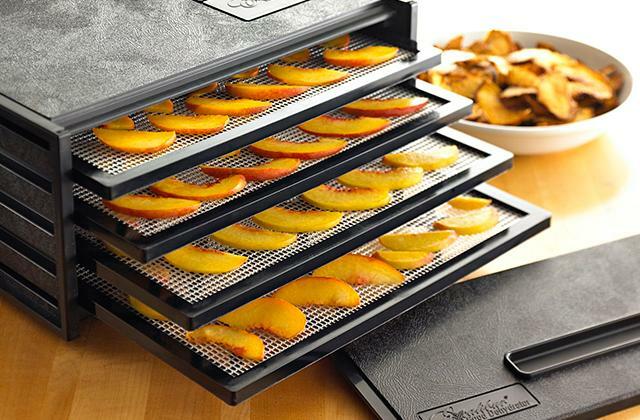 Provided you slightly soften them beforehand, the model will allow you to cut sweet potatoes, beets, and yams. The blades are detachable and you shouldn't have any issues with them. Both the blades and the base are made from stainless steel. Though it doesn't necessarily look like it, mostly because the finish is relatively unremarkable, the steel here is top-notch quality, durable and virtually immune to corrosion and rust. On the not-so-bright side, we don't care for the handle. It is really large, which is a good thing. However, it is horizontal, a choice almost as bad as the company's name because it makes the handle not at all ergonomic and really not that practical either. All that being said, Impeccable Culinary Objects ICO018 is a good cutter. It isn't necessarily the most versatile tool, sure. But the price is nice and the model's suction cups are really strong, so it will not be sliding around the countertop. 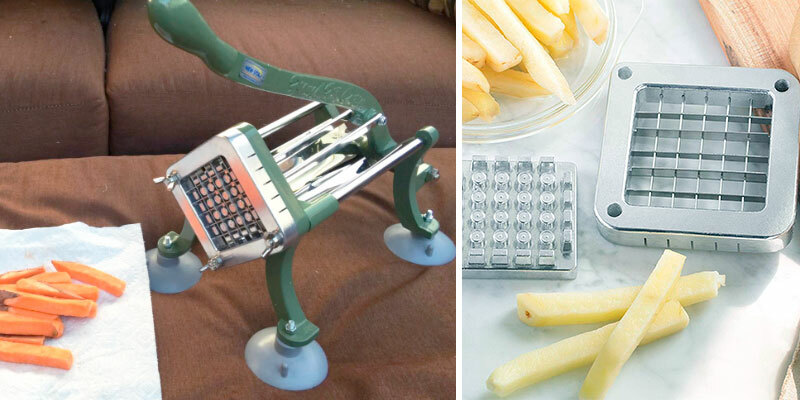 What Is a French Fry Cutter? That's precisely why recommending a french fry cutter was a no-brainer of a decision. 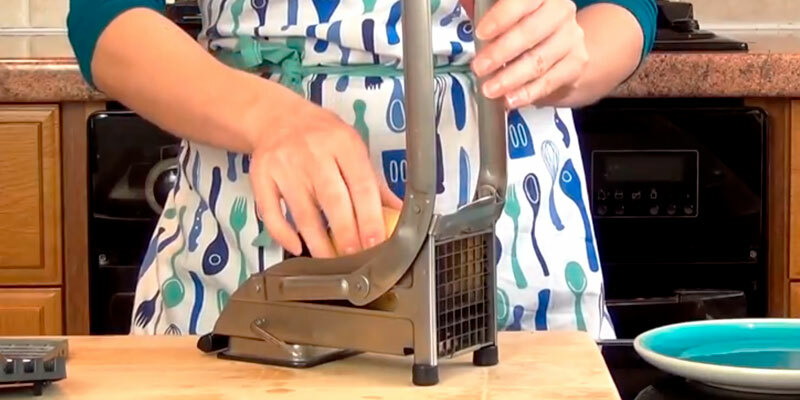 First and foremost, a tool like that will help you cut potatoes into french fries. Shocker, we know. 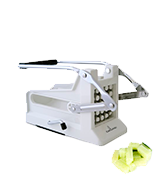 On top of that, it can be used to cut various fruits and vegetables, from apples and pears to carrots and beetroots.